eGo Ce5+ Clearomizer Kit, has colorful e cigarette batteries in 1100mAh/650mAh 3.7-4.2v manual with blue LED button. 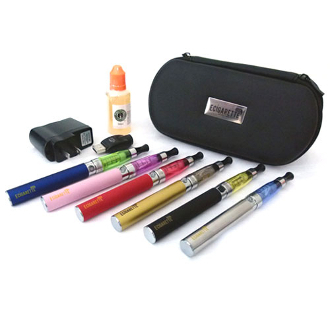 In the kit you get 2 CE5+ clearomizers in your choice of colors, you will also get two 650mAh/1100mAh ego e cigarette batteries. The batteries are strong and they last one to two days before having to be recharged. A clearomizer can hold up to 1.6 mL of eliquid. The manual button on each battery will allow you to control how much vapor you create when puffing on the e-cig. Turning the ego battery on (or off) by pressing the button 5 times in 2 seconds. (blue LED blinks 3 times). The ce5+ clearomizer head can be replaced. Remember never leave your battery unattended while charging.